Merry Christmas everyone! Today I've got an easy, quick read with lots of pictures! 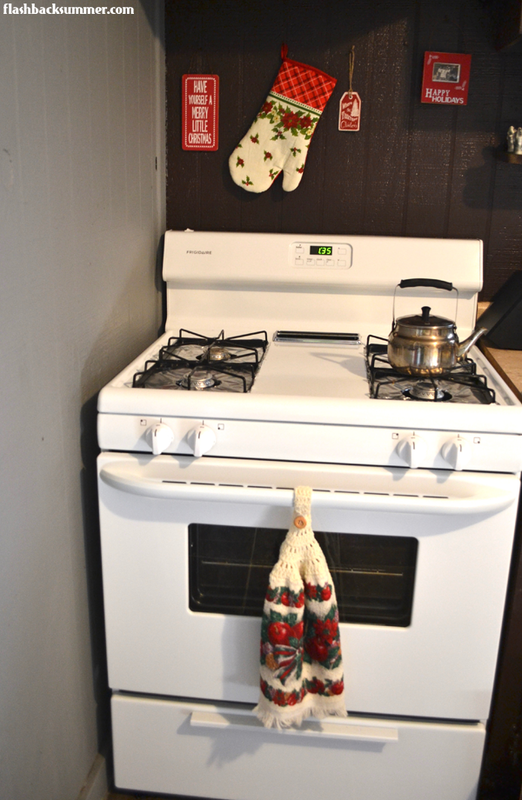 This is my second year in my own home, so I have a few more Christmas decor items I've added for the season. Last year's tree was a bit scant (but budget-friendly, may I add! 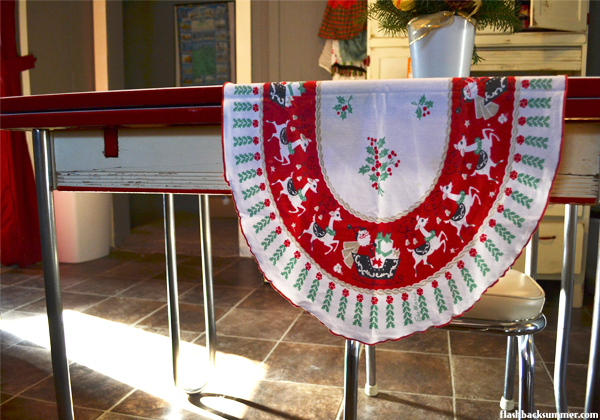 ), and a find in a flea market last year has helped fill it out! I found two plastic garlands of bells and lanterns with holly leaves and berries interspersed throughout. 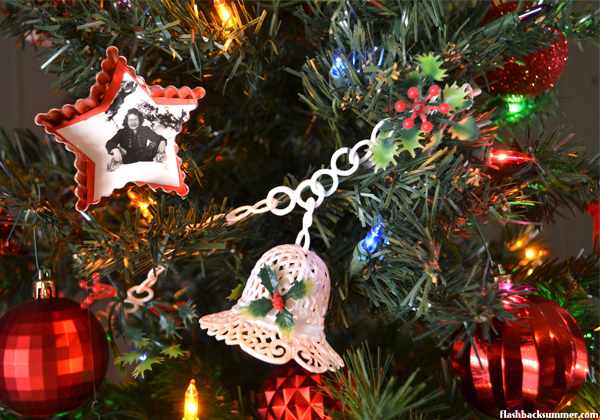 I also put up my cookie cutter ornaments I made last year. I just love the old pictures of random people in them! 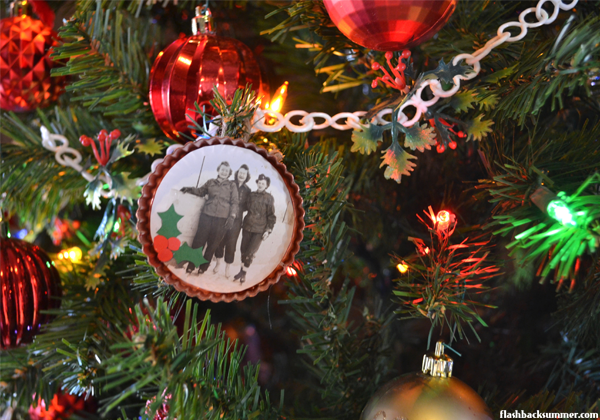 Year by year, we add a bit more to our Christmas decor, and it's a fun process! 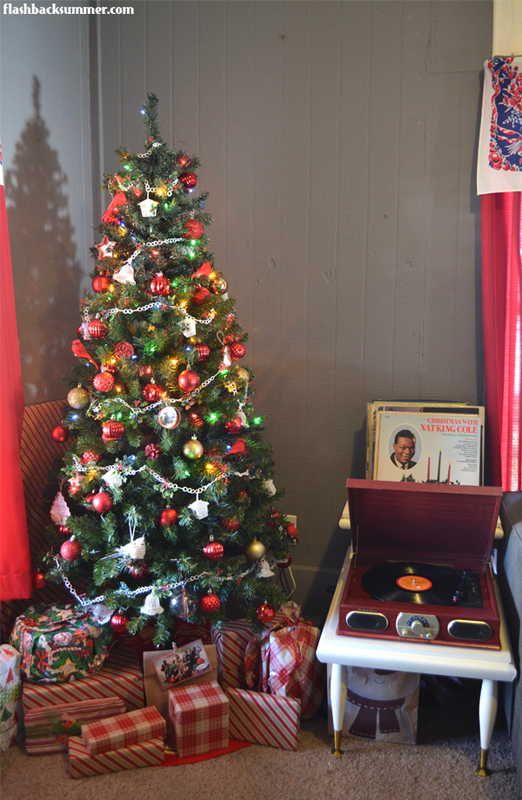 I hope all of you have a wonderful Christmas as well! Today is my 24th birthday, and to celebrate, George Lucas has kindly put out another Star Wars movie for me. (Haha!) 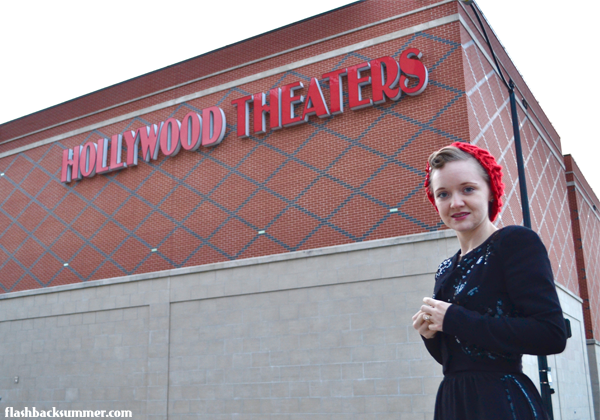 I'm going to see the movie tonight! It is a lesser known fact that I was a HUGE Star Wars buff as a kid. I was Princess Leia for a good three Halloweens in a row, complete with a bun wig and a lightsaber... because obviously there needed to be some girl carrying one, even if there wasn't in the original three movies! I'm big on themed outfits, so today is a great chance to bring out not only my Star Wars t-shirt, but also a 1940s suit set I've had for a while but never worn. When I got it, the waist was quite tight on me and the suspenders were strangely short while the jacket fit perfectly. (I think it had been cut down to fit a younger girl at some point.) Well, probably due to the exercise I've been doing lately, the waist fits much better and I lengthened the suspenders on the skirt to fit by adding some coordinating fabric in the back. I LOVE this ensemble. Suspendered skirts are always a win in my book, and I like how this skirt is slim but doesn't have the undergarment-fussiness of a fitted pencil skirt. 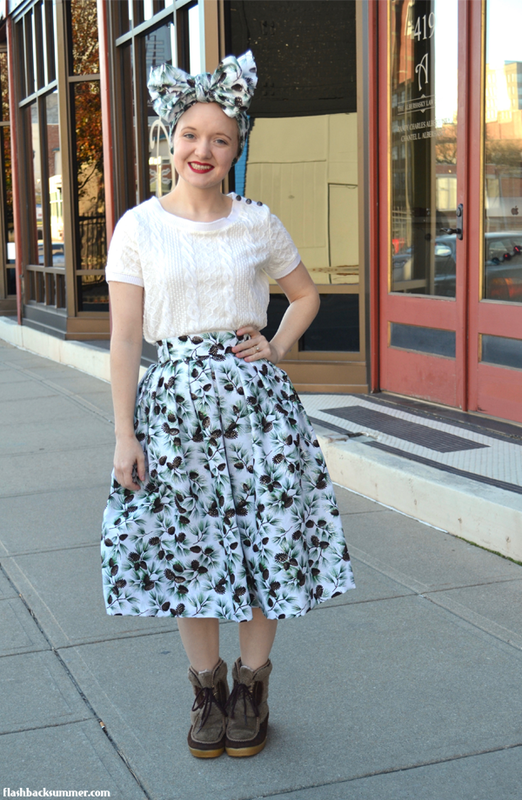 The sequin detailing and the perfectly 40s silhouette sealed the deal for me! 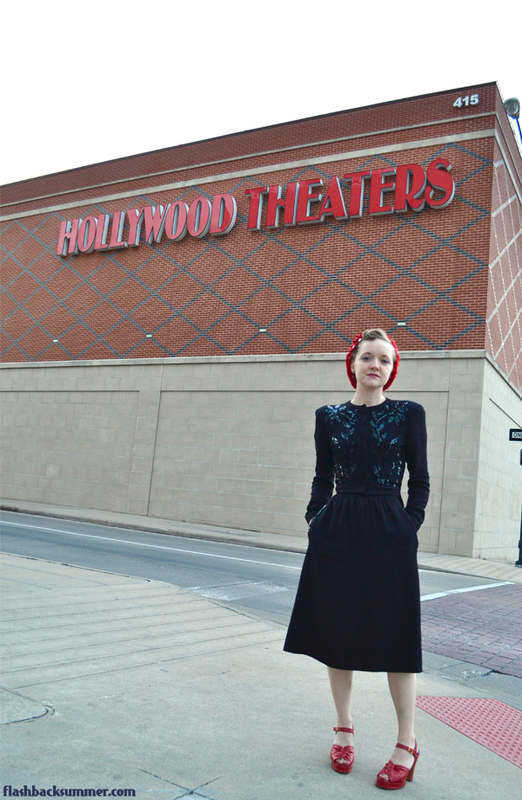 I paired black with red accessories because it's one of my favorite color combos. These red shoes are a recent purchase, and they're my FAVORITE SHOES I'VE EVER BOUGHT. 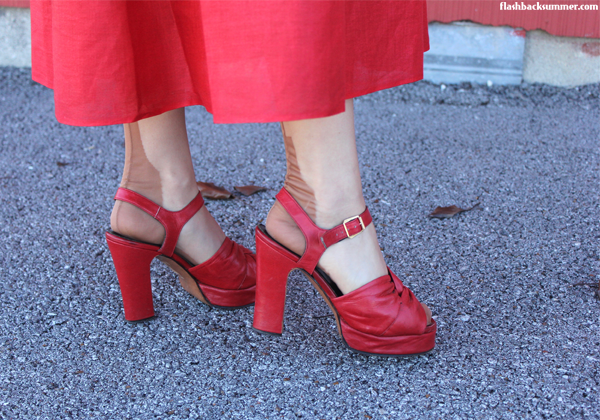 They're platforms, they're red, they're 40s, they're my size. Check, check, check, check! I splurged on them and paid a bit more than I normally would, but considering I'll be buried in them, I think it's a good use of the money. Then, to top it all off, Jacob gave me these earrings this morning before I left for work. They're a karat of diamonds and some other mysterious black gemstone that we haven't figured out yet. I have been wanting to add more studs to my jewelry box since my ears are double pierced--and more is more, in my opinion--so you'll probably be seeing these beauties often! earrings: gift from my lovely husband! 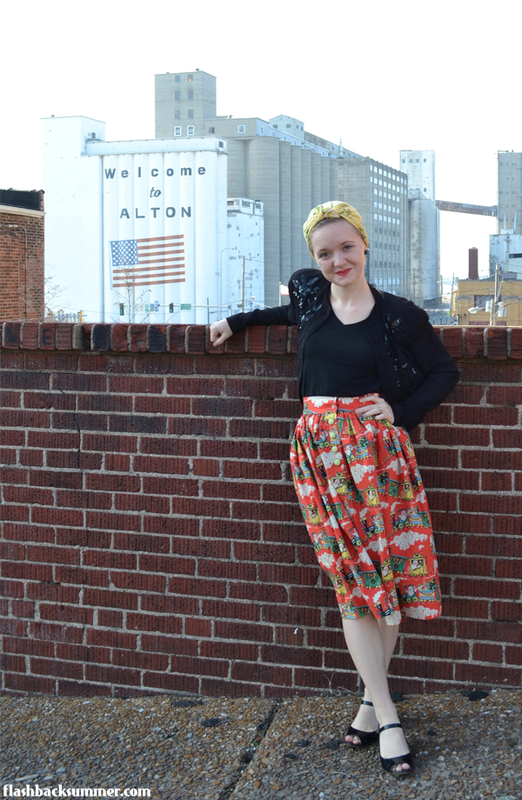 You saw my outfit a couple days ago debuting a pleated Christmas skirt. 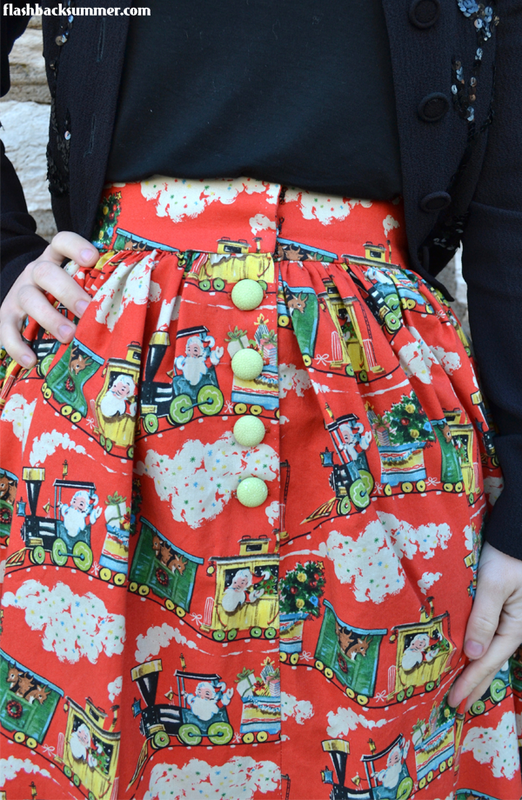 You know what's awesome about this type of skirt? 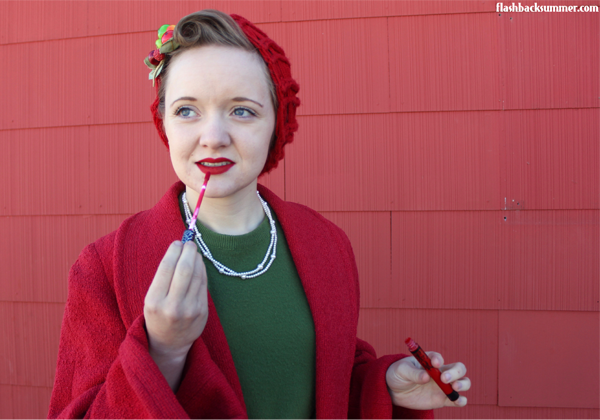 It's super easy to make... without a pattern! 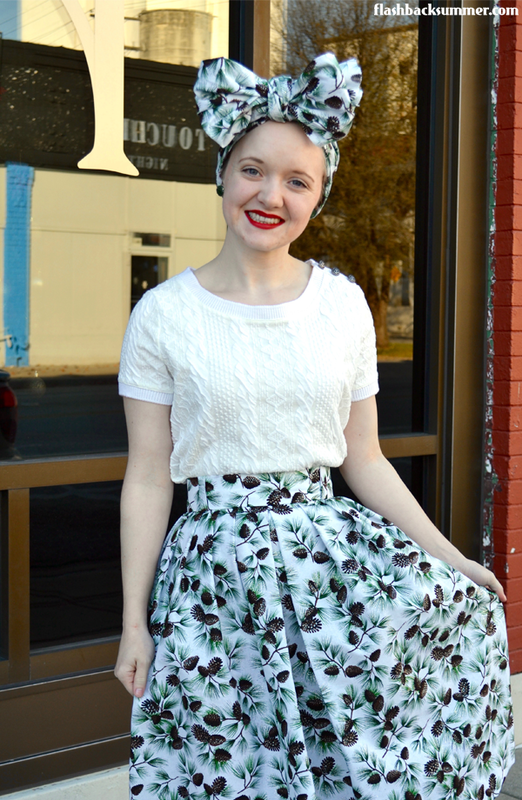 I've outlined my steps in making this skirt, and if you have any other questions, need clarification, or would like some additional photos of a step, just let me know. I'm glad to help! 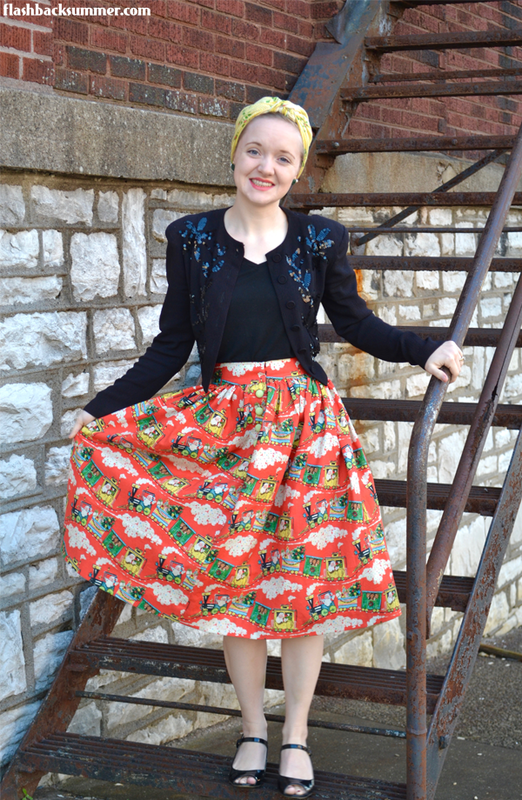 Vintage skirts for everyone! You'll need 2-3 yards of fabric (depending on how full you want it and your waist circumference), a zipper at least 7" long, interfacing for the waistband, hooks and eyes, and coordinating thread. 1. I made a waistband. This waistband is my waist circumference + 2" (1/2" seam allowance on each end and a 1" underlap). 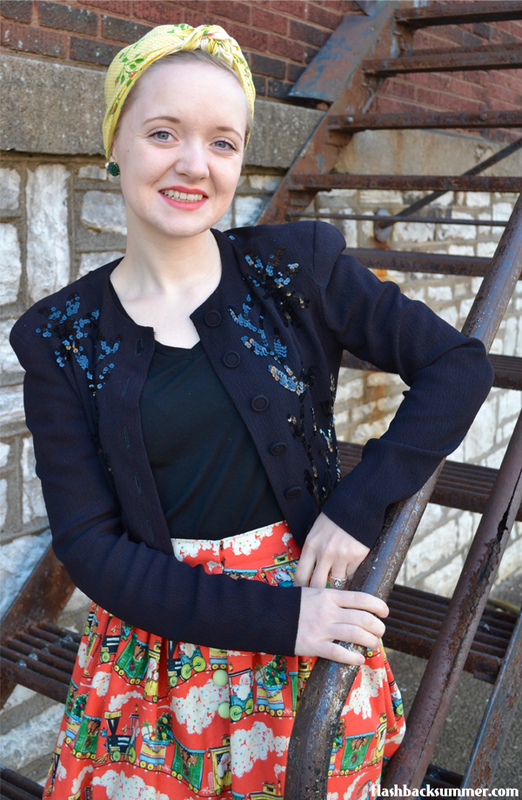 I wanted a thicker waistband than my Egyptian skirt, so the waistband rectangle is 5" wide. 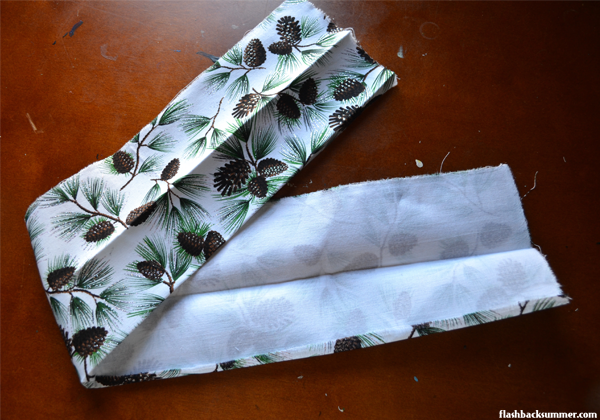 (This is a 2" wide band that is folded in half with 1/2" seam allowances on each edge.) I also added a layer of fusible interfacing on the back to strengthen the piece and ironed up 1/2" of the edge that will be inside the skirt to make it easier to sew down later. 2. 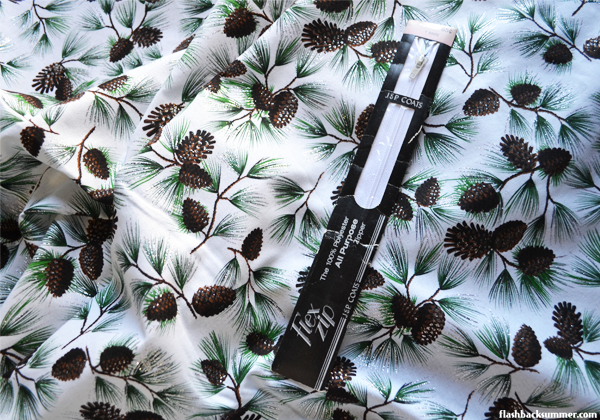 I sewed up the side seam of the skirt fabric and made a giant fabric tube. 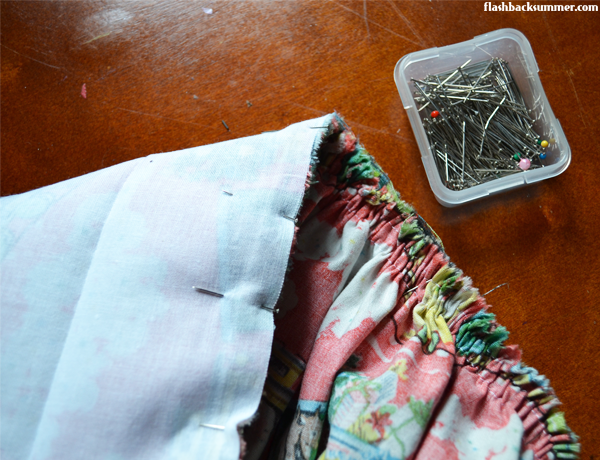 Sew up the side seam of the skirt to within at least 5-6" from the top where the waistband will go. Insert a zipper. 3. I marked the waistband in fourths. I marked the center front, center back, side, and zipper placement on the waistband. (Remember to ignore the 1" underlap at this part, since the skirt fabric won't extend that far on the waistband.) I just marked them with pins. 4. I marked the skirt fabric in fourths. This is the same as the waistband: front center, back center, side, and zipper side. 5. I pleated the skirt fabric to fit the waistband. I lined up the fourth markings on skirt and waistband and then sort of eyeballed my way through adding pleats to each skirt section until it fit the waistband. I'm 100% sure there's a more exact way to do this, but I can't be bothered with maths in sewing if there's any way around it. 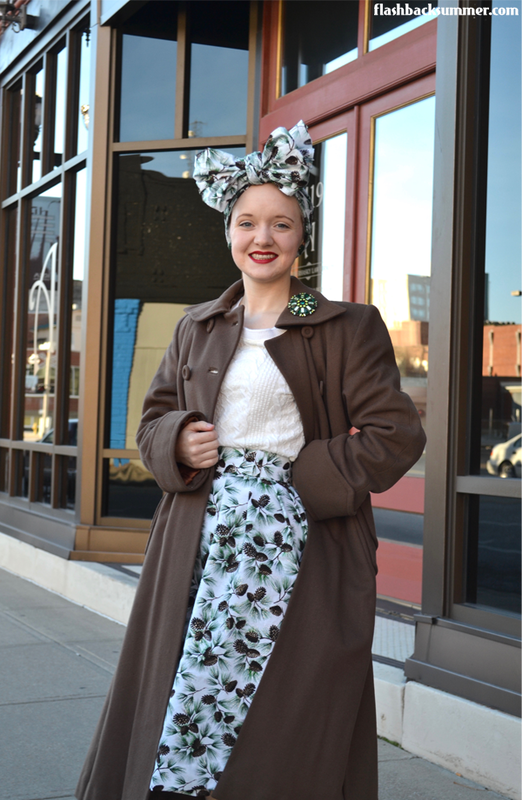 In the picture below, you can see the center front of the skirt and the direction of the pleats on either side. 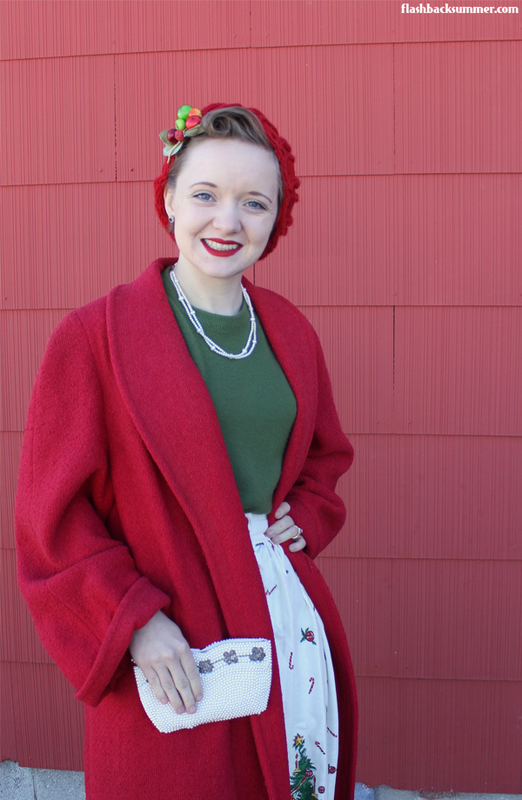 I pleated my skirt to have the zipper in the back, but you can do it on the side if you'd like. I put my "center front" pleats on the exact opposite side of the zipper. If you want the zipper on the side, then put the center front pleats 1/4 of the way to the side of the zipper. 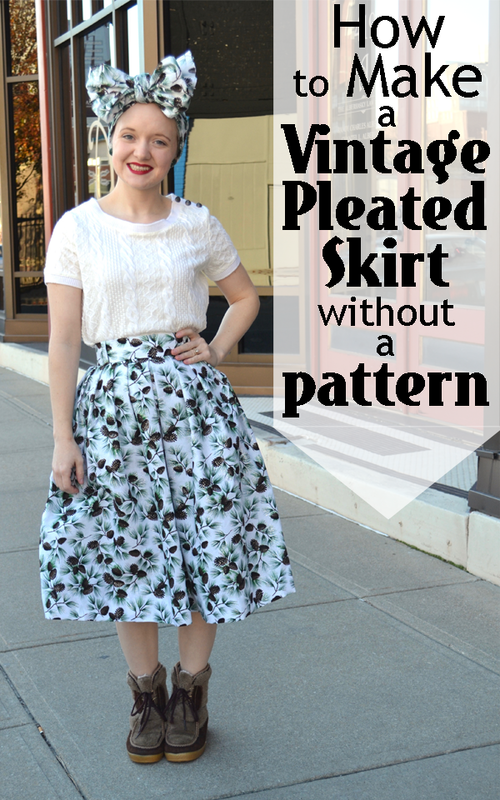 If you just lay out the skirt and waistband and visualize it, this makes a lot more sense! 6. 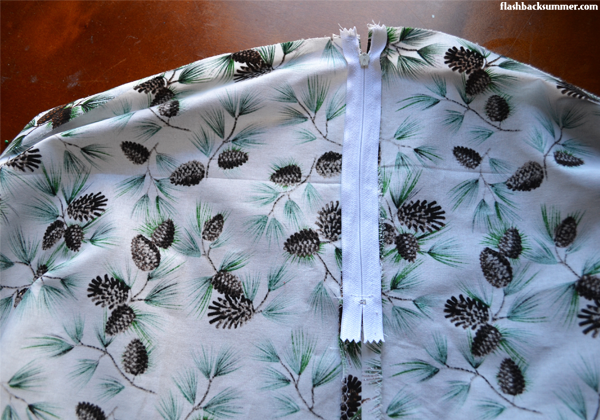 I sewed the waistband to the skirt with a 1/2" seam. First, sew the end of the waistband that will be on top, then flip it right side out. 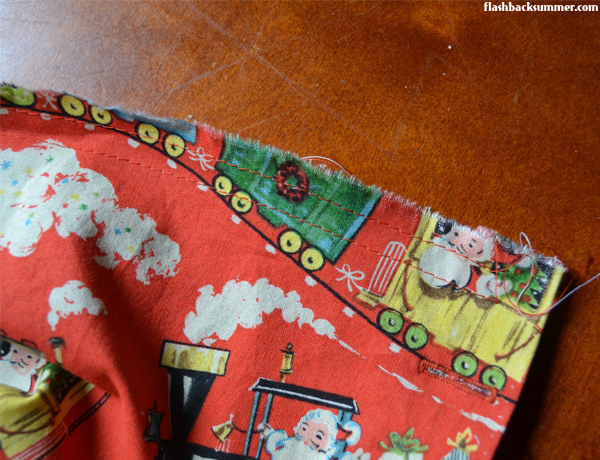 Then sew the skirt fabric to the bottom of the waistband front. Then put the underlap bit right sides together and sew, then flip right side out again. 7. Do all the hand sewing. I like to do all the machining first then finish out the skirt with my hand sewing while watching a movie. 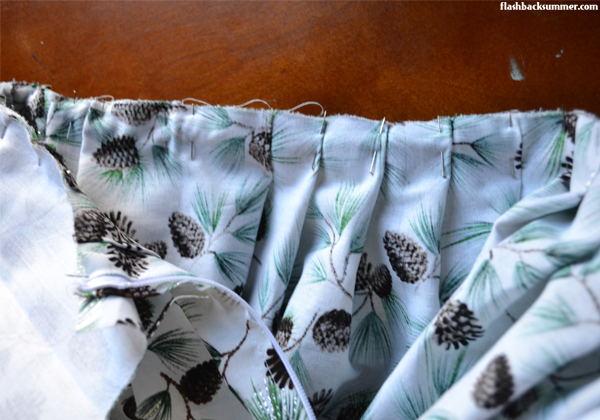 Finish sewing the waistband back to the inside of the skirt with a whip stitch, remembering to close the hole left at the bottom of the underlap. 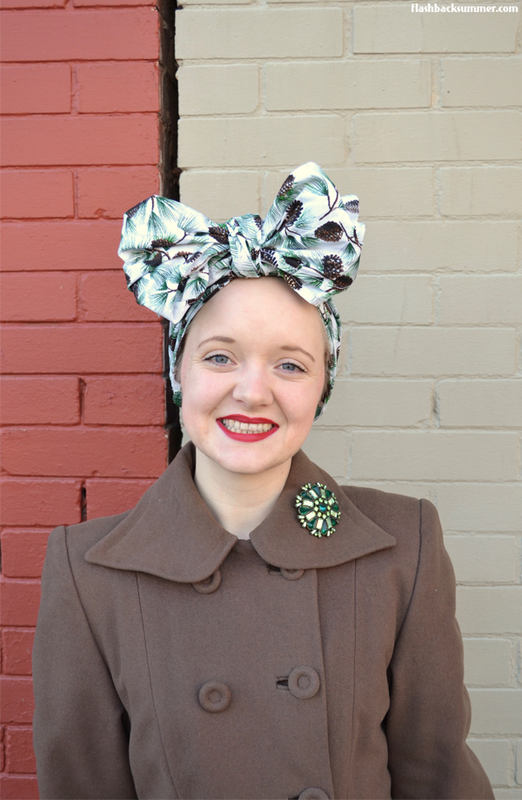 Sew on your closures of choice to the waistband. I find hooks and eyes to be most secure. Next, blind hem the skirt. 8. 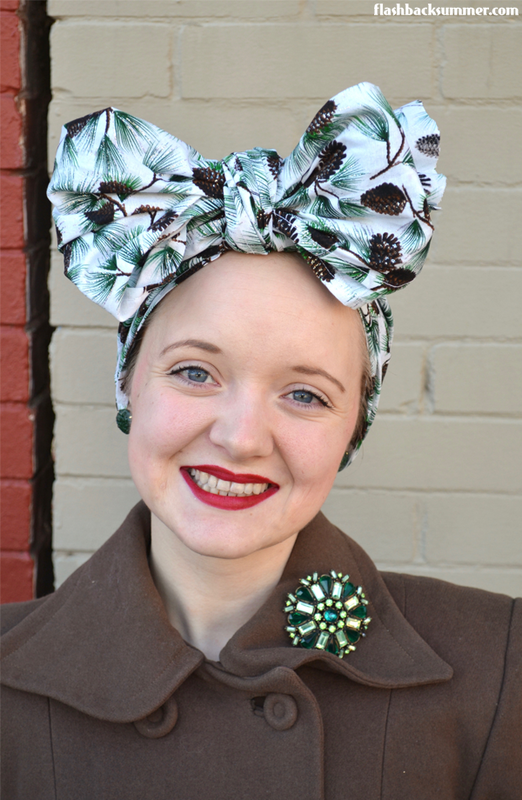 Give it a good press, and it's ready to wear! 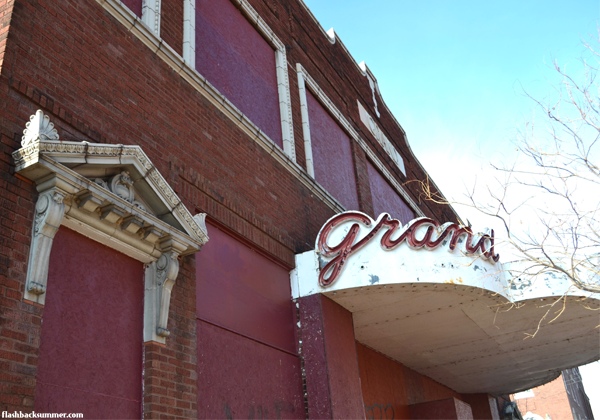 More details and photos can be found in this previous post. 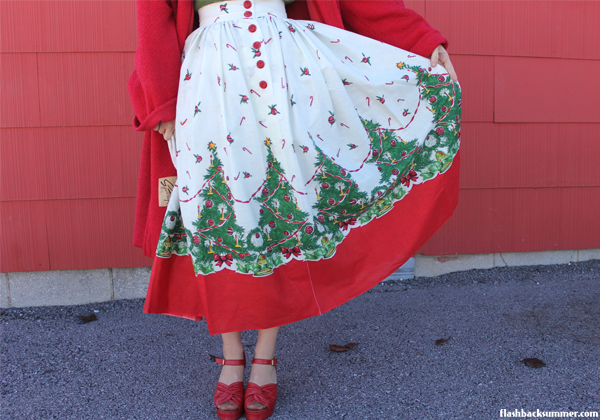 Do you have any tips on making skirts like this? Any pleating advice?! 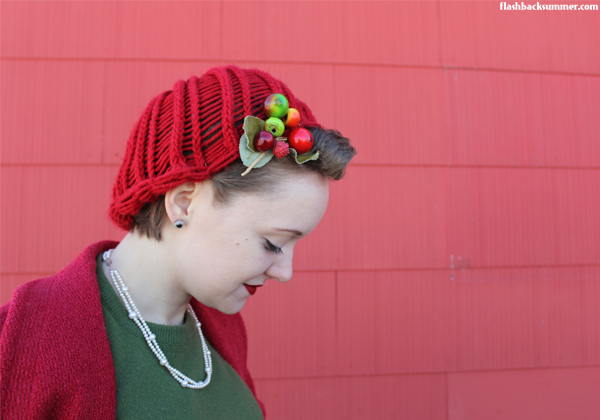 Christmas is looming ever closer, and I'm still working on finishing up the last few gifts. I love giving people thoughtful gifts that they can use in their daily life. You know what everyone does in their daily life? They drink stuff. 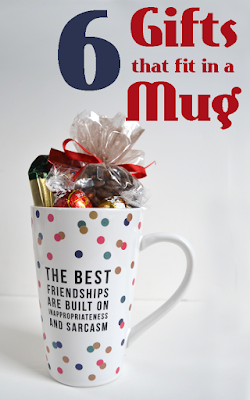 This is why a mug is great gift for nearly anyone! 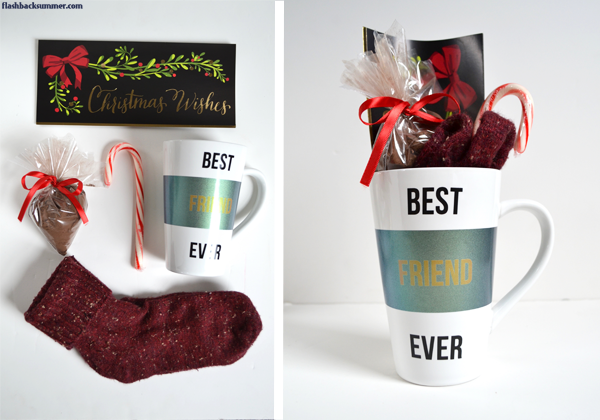 Below I've got six ideas for gifts that fit in a mug (both of these "friend mugs" are c/o Pavilion), and you can tweak them to fit the personality of the gift. 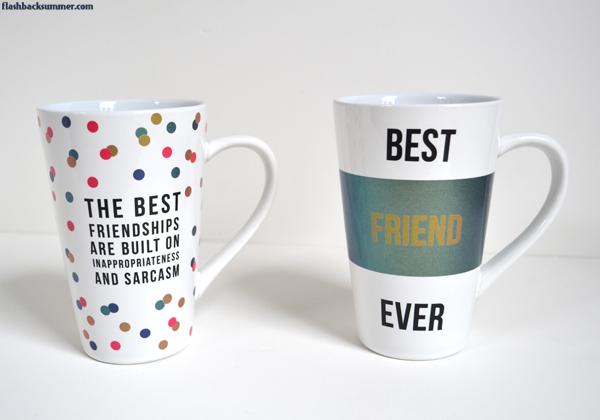 I picked the mug on the left because, obviously... it's so true. And the mug on the right just states it like it is and sparkles blue and gold, also a win! Think out of the box and create a gift for the plant-lover in your life. 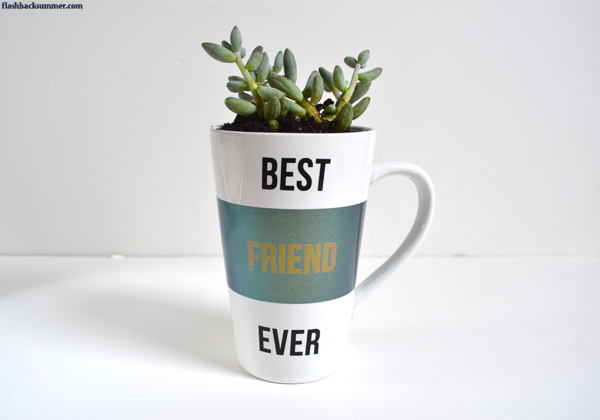 Instead of giving a plain mug, put a succulent, herb, or other small plant in it! The giftee can move the plant to another container and use the mug or have a cute planter as-is. Just in case they decide to leave it, put a layer of small pebbles at the bottom to help prevent root rot, then fill with potting soil and a plant. Oh, tea lovers. Those that love tea, REALLY love tea. And the great part about tea is that one can never have too much! If you're always drinking it, you will always need more! 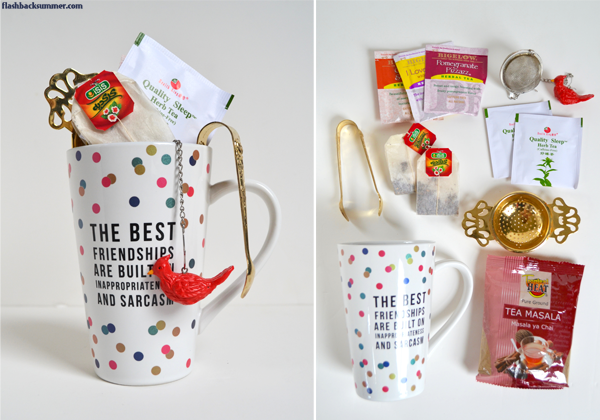 Give your tea-loving friend a gift they'll use and appreciate by filling the mug with varieties of tea and little tools to make their tea drinking more convenient. Many people warm up to mug-worthy beverages when the weather gets cold, so it's a great idea to pair the mug with cozy winter items. Create a "cozy kit" with fluffy socks, a comforting holiday beverage like hot chocolate, and a gifted Christmas or relaxing song list from iTunes or Amazon. Last but not least, a gift for the caffeine lover! 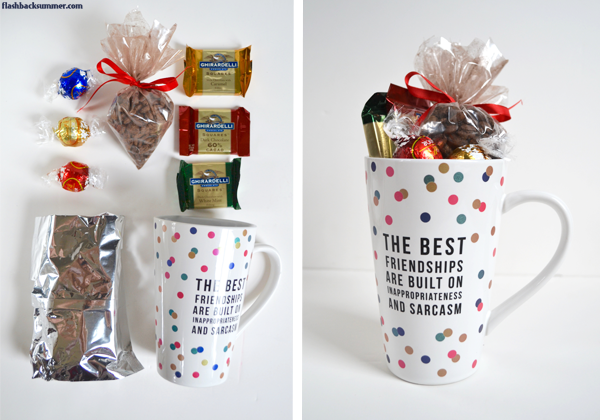 Fill the mug with bags of ground coffee in different flavors, chocolate covered espresso beans, and small squares of nice chocolate or truffles. Everyone loves a bit of delicious luxury in their day! 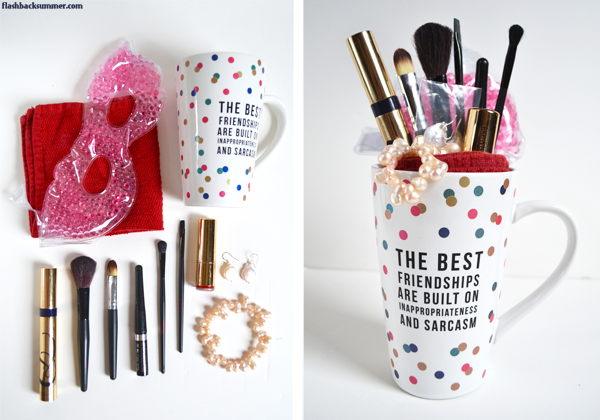 For that friend that loves to doll up, fill a mug with little makeup bits and accessories she is sure to appreciate. 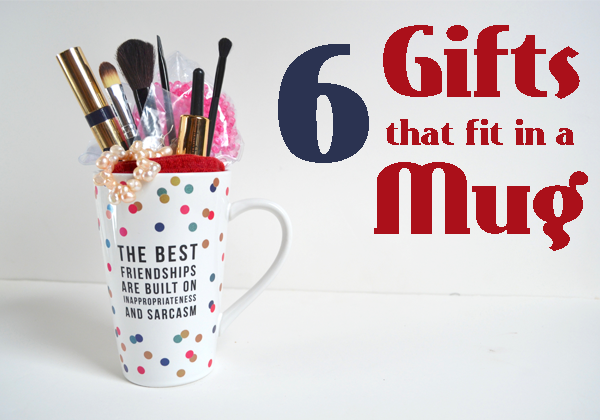 If you're on a budget, collect makeup samples and artfully arrange them in the mug, or go high-end and include a nice lipstick and a couple makeup brushes. 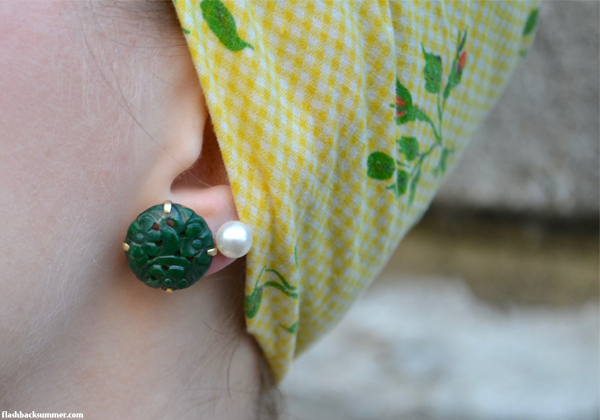 You can also throw in some small accessories like a pair of earrings or bracelet to complete the gift! 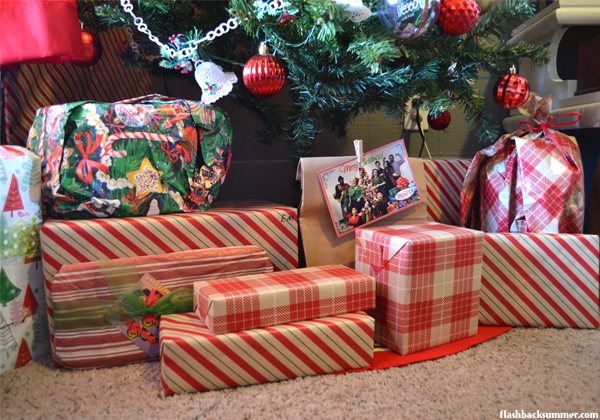 I hope these ideas help you finish out your holiday gift list! 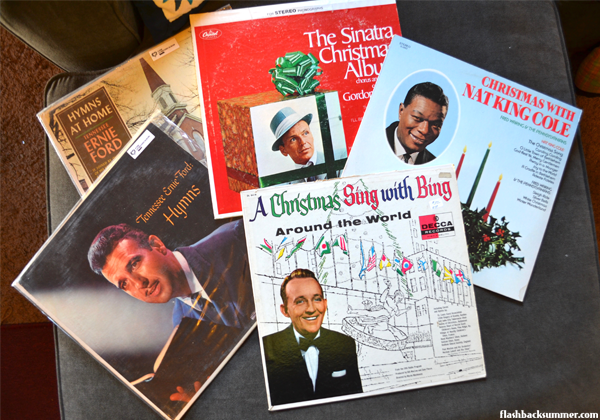 Do any of them sound just perfect for a friend or family member? 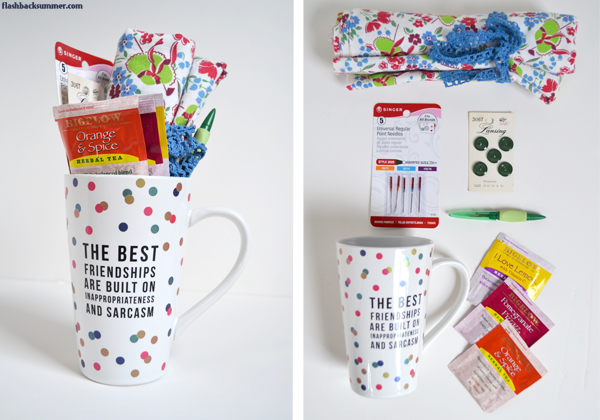 The mugs in this post were provided c/o Pavilion Gifts, and you can find them here and here! 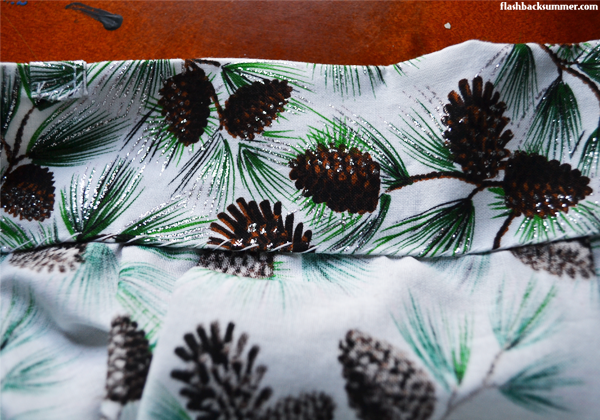 I try not to impulse buy, especially when it comes to fabrics. 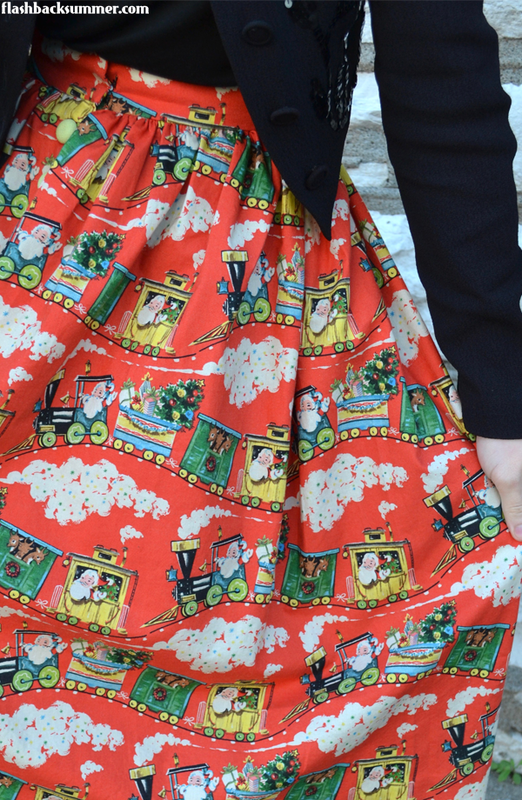 However, this one certain Christmas fabric continued to call to me day after day... So after a couple weeks I determined this would NOT be an impulse buy and that I really, truly liked it. 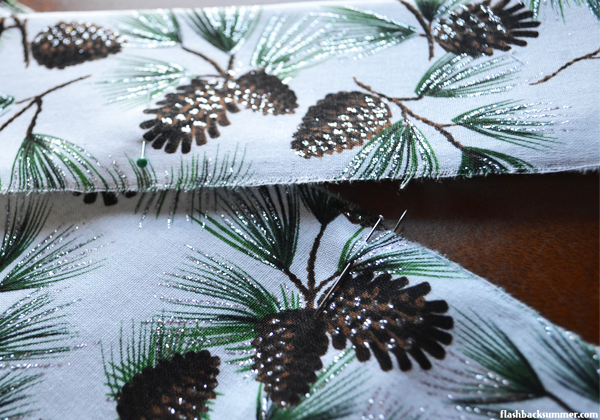 So I bought three yards of this glitter pinecone fabric! 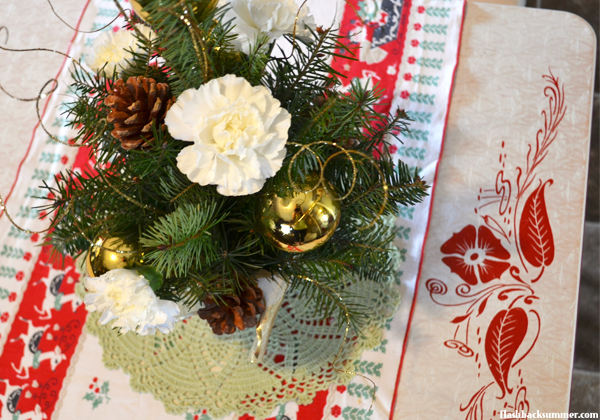 And what do you do with sparkly Christmas pinecone fabric? 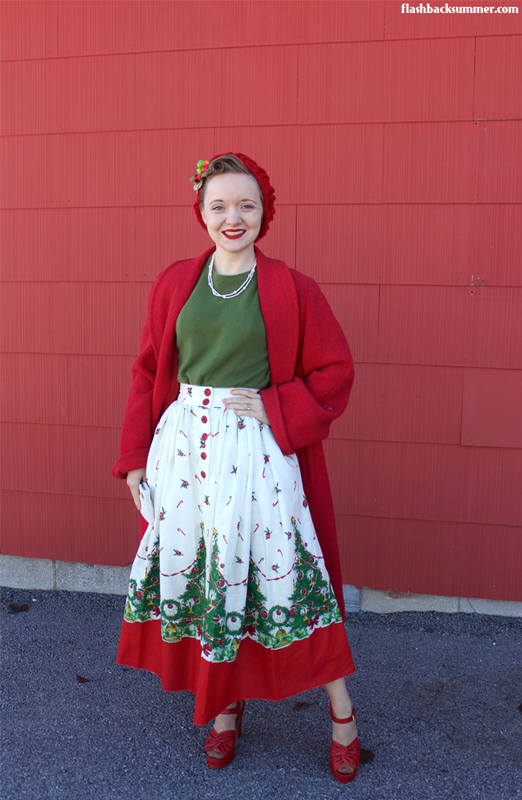 You make a gaudy Christmas skirt, of course! (At least, that's what I do!) 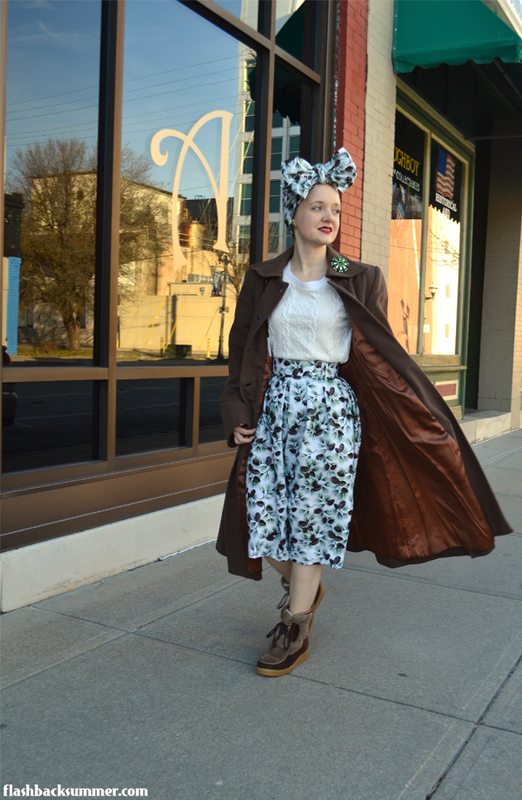 I whipped this together and made a simple skirt and matching 40s duster cap. 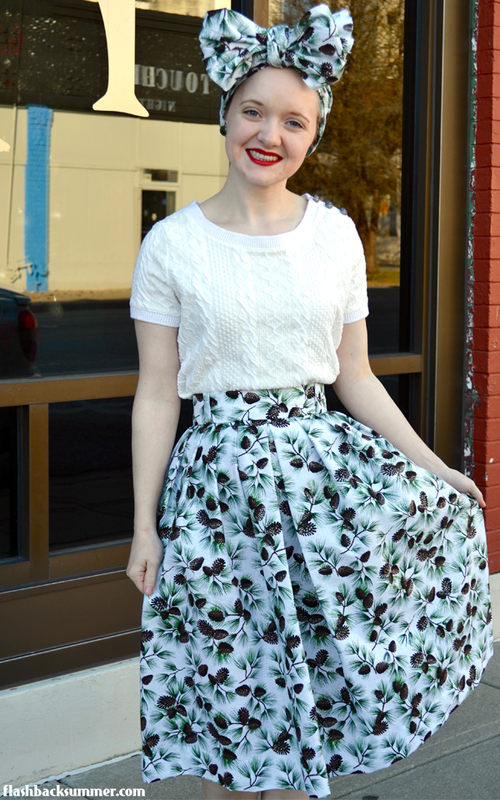 In an upcoming post this week I'll show you how to make a pleated skirt like this without a pattern, so stay tuned! 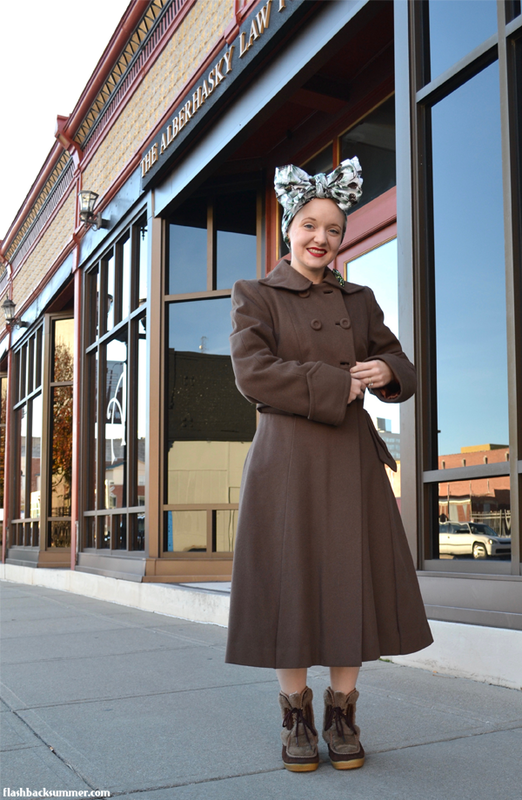 I paired it with my new 1940s winter coat and 1970s boots. 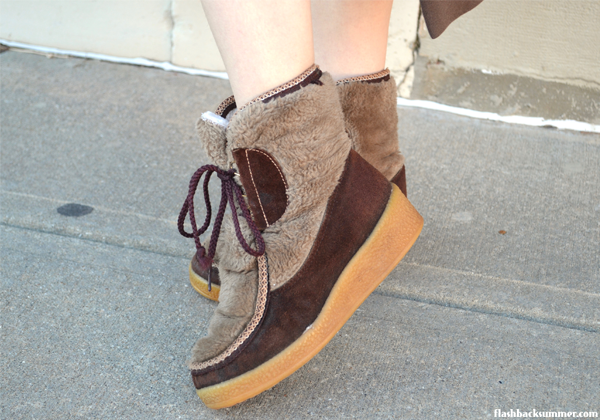 I am in pretty desperate need of winter clothing, and these two items do the trick perfectly! Unluckily... the U.S. is having its warmest winter ever, pretty much, so I haven't needed them as much as I would normally. But I don't care, I shall wear them happily!